In this article I hope to refocus attention on the Aeolid Nudibranch Berghia as a species of interest and value to the aquarium hobby. What little information exists in popular hobby literature on the topic is indeed concise and sufficient for guiding those intent on succeeding with the culture of this organism. Yet, after more than 10 years since its introduction to aquatic science, this utilitarian sea slug eludes many willing commercial and private interests of mariculture. I regard the still-diminished presence of the animal in the trade to be an issue in need of address. Among the traditionally difficult, if even possible to keep, specialized members of the Aeolid nudibranchs, Berghia are not only attractive, easy to keep, and easy to breed… but they also readily consume one of the most bothersome pest organisms in marine aquaria: Aiptasia anemones (AKA glass anemones). The genus Berghia is widely distributed circumtropically in warm and temperate waters. The organism that most people recognize and seek for Aiptasia control is commonly identified as Berghia verrucicornis (A. Costa, 1864). However, there seems to be some debate about the number and name of species cited or held in regard under this guise. Field pictures and observations of several specimens called by this name throughout the Atlantic, Caribbean and Mediterranean reflect not only variable color, but different morphologies including contrasts between shapes of rhinophores and cerata, the presence of tubercles and ridges or not, and some differences seemingly in the structures of their egg ribbons. It would not be surprising if more than one species makes its way into the aquarium trade. Another widely distributed Pacific Berghia, B. major, also lives by the same modus operandi of preying on Aiptasia. The most prevalent stock of Aiptasia-eating nudibranchs in the American trade, however, is heralded as having been collected from the Florida Keys (east coast USA). Adult Berghia grow to about 1" (25 mm), with some growing slightly larger. Their backs (dorsa) are covered with handsome, colored, tassels known as cerata. Cerata perform functions of respiration, digestion and defense. Although this Nudibranch consumes and utilizes the zooxanthellae of its Cnidarian prey, they cannot be sustained adequately by the borrowed symbiosis with good lighting alone and they must be fed Aiptasia several times weekly, if not daily (adults can starve to death in mere days without Berghia). With adequate supplies of anemones, however, Berghia will be self-sustaining; that is to say, they will reproduce and maintain a breeding colony. For their readiness to propagate, inexhaustible demand from ongoing nuisance growths of Aiptasia in overfed/overstocked aquaria, and their high dollar value ($10-$30 USD each), Berghia are highly desirable candidates for the aquarium trade. It is interesting and noteworthy to mention that the reason Berghia are needed in the first place is both ironic and avoidable. If aquarists would quarantine all new livestock (not just fishes… but plants, algae, live rock, sand, corals, etc.) and did not overstock or overfeed their systems, then Aiptasia would be an almost unmentionable concern. Nuisance anemones do not grow from thin air, or sterile water as it were, but need food and nutrients to survive. When they are not properly screened in quarantine, and then introduced into a conducive aquarium system - only then do they proliferate. The all-too-common realities of busy or neglectful aquarium keepers are the things that Aiptasia thrive on: poor water flow (less than 10-20X minimum turnover), which allows particulates to accumulate and settle to feed anemones, overfeeding and/or overstocking, poor lighting which allows pest Aiptasia to outcompete more demanding and desirable organisms (like corals, plants, macroalgae) for nutrients, and poor nutrient export mechanisms (neglect of a well-tuned skimmer, weekly changes of carbon/chemical filter media, frequent water exchanges, etc.). Further compounding the problem, Aiptasia are naturally prolific and successful in reproductive strategies. With adequate light and food they multiply rapidly by budding and pedal laceration. With inadequate light (even darkness!) 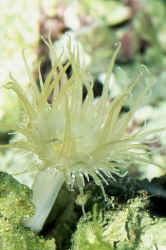 they will issue numerous asexual buds that drift with the purpose of surviving elsewhere [note: imposing dark cycles is a way to successfully exploit this anemone into producing smaller Aiptasia to feed small Berghia in culture]. We may have to bow with chagrin, but Aiptasia will continue to be an ever-present inevitability in the aquarium trade, and Berghia are direct solutions to this pest organism. One of the biggest obstacles to the care and culture of this sea slug has been their small adult size and vulnerability to common aspects of aquarium filtration, e.g. pumps, overflows, etc. Similarly, hatched juveniles cannot be clearly seen with the unaided eye for many weeks' time after hatching, perhaps up to two months. And subadults are commonly shipped at ?" (12.5 mm) and are still rather physically delicate to handle. For those receiving shipped Berghia, please note that it is best to simply sink the transport bag or cup into the new vessel for a gentle acclimation of 15-20 minutes and then allow the sea slugs to crawl out on their own volition. All of this is to be done without illumination as a comfort to their nocturnal tendencies. It should also go without saying that the culturing vessels should be well-established with aged water for some weeks in advance before seeking specimens. Newly mixed seawater is harsh to many reef creatures… but particularly so to invertebrates. Also, do not underestimate the need to have a significant supply of Aiptasia on hand; hundreds of anemones will be needed to support a single pair of Berghia for the first few months. Any realistic plans for keeping Berghia at any size will necessarily embrace a specialized system at the start. I strongly recommend that all new Berghia be acclimated in isolation. An appropriate home for them could be as simple as a floating plastic cup or beaker, or something as elaborate as a refugium. The pitfalls of the latter, however, will likely include a pump or overflow at minimum. I recommend glass beakers or plastic cups submerged partially in a temperature-controlled aquarium. Note: it is critical to keep these containers tightly covered to reduce evaporation, in which salinity can stray quickly and fatally to the nudibranchs in such small volumes of water. Isolation gives these small creatures a little bit of time to acclimate to the aquarist's water quality and schedule of husbandry. Aquarists interested in culturing Berghia must naturally engage this species in monospecific culture. Others who seek only to reduce nuisance populations of Aiptasia in another system or display will still want to isolate new Berghia at first to give them a good start. Small rocks covered with Aiptasia can be placed in the culturing vessels for the first few weeks until Berghia become established. Placing newly purchased Berghia directly into a display tank is not recommended - they will almost certainly die or be killed by any one of a number of pitfalls in the aquarium before they completely eradicate plague Aiptasia populations. Many common community fishes and invertebrates will damage or eat small "Nudis" out of curiosity if they are simply dropped into an aquarium. There is also the concern that they will fall to the perils of high water flow, and the aforementioned pitfalls of pump intakes, overflows, etc., before they can establish themselves and breed. Considering how expensive they are to acquire, it only seems sensible to provide them a good start in isolation; a mere matter of days or couple of weeks is all that it takes to collect egg masses from active breeders. A little patience with quarantined Berghia in this case can easily translate into tens or hundreds of propagated nudibranchs to fight the Aiptasia battle for which they were purchased. In light of all of this, the relationship between Aiptasia and Berghia begs a question that Eric Borneman (1998) and others have raised on the subject before, "Can we expect Berghia to completely decimate populations of Aiptasia in our aquariums and if so, what happens to the nudibranchs when they do?" It's a matter of inverse predator-prey relationship: Berghia flourish (population goes up) while consuming Aiptasia (population goes down) and then high densities of Berghia can no longer be supported and crash (population goes down) while Aiptasia recover (population goes up). The dynamic is played out in countless ways throughout the living world between other organisms in predator-prey relationships. Recent studies, for example, have claimed to dispel the remarkable natural phenomenon of cyclical die-offs of rodent lemmings by this "boom or bust" population rhythm. The sometimes-sudden (100-1000-fold) expansions in lemming populations are intimately linked to the numbers of four specific predators, one of which (the stoat) is key as they prey upon the rodent to exclusion among possible prey, like Berghia do upon Aiptasia. An infinite supply of Berghia in any display is not assured, or even likely, without assistance from the keeper. A spike of prey, then spike of predator, then drop in prey, and subsequently a drop in the numbers of predators can be expected. Unlike wild habitats, however, the home aquarium is not a balanced ecosystem and we cannot expect that some Berghia will always weather the cycle. As such, I cannot repeat and recommend strongly enough the importance of the need for maintaining broodstock of Berghia even for aquarists that merely wish to control Aiptasia in a display (versus culture the nudibranchs). Neglect of this admonition would be a waste of a living resource and, at best, require that the keeper repeatedly buy Berghia with the "boom and bust" cycles of prey over time to control their pest anemones. Most anyone with experience culturing Berghia will recommend the same thing regarding housing: it's best and easiest to grow these sea slugs in small cups or beakers (250-1000 ml). The challenges of concentrating, feeding and locating such tiny organisms in even the smallest aquaria otherwise are daunting. Plastic cups floating in thermostatically controlled aquariums seem to work very well for this purpose. Rods, pipes, or lines can be used to cordon off the floating vessels at the surface so that they don't bump around or capsize in the display. All containers resting on a submerged PVC "table" is better still. Water quality can be a bit of a challenge in small cups due to evaporation, so its important to mark the sides of the cups or beaker with a line to indicate where to top off the vessel with distilled or RO/DI water to compensate for evaporation. Keeping lids or covers on culturing vessels will also be very helpful for slowing evaporation and the resulting stress caused by fluctuating salinities. Frequent water changes will also insure optimal water quality (several times weekly for adults). The culture of Berghia in this manner is really quite easy and straightforward, but is admittedly tedious and indeed a part of the final price of the creature for the inconvenience of husbandry. Small lengths of flexible airline tubing and plastic or glass pipettes are handy for conducting water exchanges, removing debris/feces, and for transporting small Aiptasia between cups. In preparation for the arrival of Berghia, place a couple of Aiptasia in each of the cups that will hold the beloved Aeolid specimens. Be warned though that it is quite possible to have too many Aiptasia in a cup; they will compete for desirable elements in the water, and they can slough copious amounts of slime or mucus and degrade water quality. It's also best to let Berghia prey on just one or two anemones at a time in small cups or beakers for the obvious reasons (water quality). Be mindful that vessels, instruments, hands and anything else that comes into contact with live Berghia are clean and free of contaminants. Nudibranchs, like many invertebrates, can be very sensitive to small concentrations of foreign substances and may suffer great morbidity or mortality from exposure to these substances. It's easy to overlook potentially fatal toxins like matter that might be under one's fingernails or on the hands, adhesives on equipment (e.g., glue left behind from the peeled price tag on a bit of submerged tubing), residues from used cups, or residual cleaning products on towels used near the culture system (transferred onto dried hands, or dipped into the water by accident). Larvae are particularly sensitive to these types of contamination. The rule here should be to cleanse hands and objects of the system thoroughly in pure freshwater only (de-ionized, if possible). Water changes on vessels with adults can simply be done by wiping out the walls of the containers and pouring off the old water before gently tipping in seawater from the tank of healthy aquarium water in which the culture cups float. After a pair spawns, it's usually best to remove the breeders to a new cup and leave the eggs undisturbed. Take note of the spawning date to track the progress of the egg mass(es) for hatching predictions and preparations. Heehee… it sounds as funny to me writing it as it does to you reading it perhaps. But nonetheless, culturing Berghia will require an address of producing a consistent and adequate supply of food-Aiptasia. A novel way of producing small Aiptasia is to keep a broodstock population of the pest anemones in the dark for some weeks/months to produce tiny asexual buds. Feeding the anemones during this time will be necessary in the absence of light. Like many cnidarians, Aiptasia can be maintained under inadequate illumination by compensating with extra food. In overrun displays, it is this very thing that is the catalyst for plague populations of the anemone: excess nutrients. As many aquarists know, it does not take much for illuminated and fed Aiptasia to proliferate. They can also be propagated by way of simple division… or rather, laceration. No doubt, they are challenging to eradicate from display aquaria and attempts at scraping or rasping them off the rocks has often met with dismal results as the effort only increases the numbers of Aiptasia for the buds formed by residual pedal tissue. Aquarists interested in culturing Berghia will inevitably want to set up a tank for co-culturing food Aiptasia for a controlled and reliable source of prey to offer. Berghia reach sexual maturity early (at approximately 12mm) - long before they achieve full adult size. Eggs are laid in a characteristically spiral egg-casing fashion. Spawns may be deposited on or underneath a rock, if available, but can be found conspicuously on the aquarium or container walls just the same. Occasionally, the egg masses will be released in free-floating strands (often so, if they are disturbed while egg-laying). Reproductive events can be amazingly frequent at times with well-fed and well-conditioned young adults, occurring at a frequency of one egg ribbon laid every one to two days - per individual! Older specimens naturally slow down and are less prolific. It is possible to start with one pair of Berghia and have a couple hundred individuals in just a month or two. As you can imagine, the need to provide adequate supplies of Aiptasia to feed such colonies soon turns your problem from an Aiptasia plague to a Berghia plague! Fortunately, Berghia are so highly prized that it is not difficult at all to find wanting and waiting homes for your surplus juveniles through local channels or online. In kind, it is not difficult to find fellow aquarists locally with Aiptasia covered live rocks to share. Recruiting food for your Berghia may be as simple as exchanging clean rocks for anemone covered rocks pound for pound with other aquarists delighted to get rid of their nuisance anemones. Nonetheless… home culture of Aiptasia is still necessary as a more reliable means of insuring adequate food supplies for the Aeolid. Berghia are truly ideal and profitable specimens for the cottage industry of reef invertebrate reproduction. Which brings us to another wonderful aspect of this Aeolid's anatomy - they are hermaphrodites, which spawn reciprocally and take turns fertilizing each other eggs. (note: self-fertilization and fission are rare by comparison). Courtship is a conspicuous dance (OK… a slow dance) with two individuals in a spiral "embrace." If you think it looks like your mating pair are necking, you are not mistaken. The genital openings on Berghia are on their right side (notice their right-side aligned positions in the images) just behind the rhinophores (dorsal tentacles). Their heads must be very close together for the successful alignment of copulatory apparatus. The larvae of B. verrucicornis are lecithotrophic; metamorphosis occurs soon after hatching, which makes aquarium culture much easier than species with extended larval stages. In layman's terms: hatched larvae do not have a long or complicated stage or series of stages of development as plankton, but are non-feeding and settle out to the seafloor rather quickly to begin feedings like adults, in a matter of days. As such, the aquarist is spared the tedious co-culture of specific larval foods like with so many other reef organisms that have feeding planktonic stages. Very small Berghia simply eat very small Aiptasia - or, at least, they will develop faster and easier in captive culture if spared the monumental task of wrestling large, oversized Aiptasia once they begin to feed. Make no mistake, this predatory sea slug can, in fact, be prey for Aiptasia in some circumstances such as poor acclimation techniques where Berghia are poured into the aquarium and dropped into the open and waiting tentacles of a hungry anemone! Young Berghia forced to contend with oversized Aiptasia may even be observed to pull back, as if rebuffed, on an approach to the anemone and may consequently decline a feeding opportunity. To the aquarist's further advantage, larval Berghia hatched in un-aerated vessels may navigate the planktonic stage and settle out faster to begin feeding on anemones. My limited experience rearing hundreds of these nudibranchs does not yet dispute this theory, and I'm eager to examine the issue more closely in time. At least one reference cites excessive aeration of egg-bearing containers as an impediment to proper embryonic development. At any rate, rest assured that adults and egg masses alike need little or no aeration when water quality is kept well via regular water changes and due diligence with evaporation compensation. Egg ribbons will hatch in 10-14 days depending on temperature (a range of 76-79? F/ 24-26? C is recommended). It will be some weeks before the juveniles can actually be seen with the naked eye - about two months, in fact. Nonetheless, keep small Aiptasia in the culturing vessel and observe the decline of the hardy anemones as evidence of predation. It may be helpful to artificially hatch the egg capsules by "pumping" them into and out of a pipette repeatedly. The rasping motion will rupture the casing and liberate the larvae. It's difficult to say exactly when is best to conduct an artificial hatch in this manner. After some time and experience though, the aquarist will notice that after 9 or 10 days, the egg's casing takes on a milky or hazy appearance with embryonic development and growth (versus the crisp and clear appearance on day-one with tiny "dots" in it). One of the biggest obstacles to rearing Berghia, as mentioned before, is providing enough Aiptasia of suitable size. The failure of juveniles to develop cerata is often attributed to attempts to feed anemones that are too large for juvenile Berghia to successfully attack. Lacerated adult anemones may be helpful in the absence of an adequate supply of small Aiptasia. Nicking, notching or shredding the pedal base of feed-anemones opens the door, so to speak, for tiny Berghia to begin feeding, as well as facilitates reproduction by pedal laceration with any tissue left alone long enough to regenerate. Note: it is a common and potentially fatal error by breeders of Berghia to sell offspring that are too young and too small. I have seen cultured specimens sold so small that half a dozen could fit on the tip of a pencil eraser… some are even sold without well-developed cerata! This practice is both poor business and poor husbandry. The aquarist is advised to simply stall the launch of his sales/business/trade in cultured Berghia by as many weeks as necessary for proffering larger and more stable specimens. I recommend shipping at 10-12mm minimum size. Please be sure to explore the references listed in the bibliography of this article for further insight and perspective on the genus Berghia for aquaria. Borneman, E. 1998. Successful rearing of the Aiptasia predator, Berghia verrucicornis. J Maquacult 6(3):49-55. Carroll, D.J. and S.C. Kempf 1990. Laboratory culture of the aeolid Nudibranch Berghia verrucicornis (Mollusca, Opisthobranchia): Some aspects of its development and life history. Biol. Bull. 179: 243-253. Carroll, D.J. and S.C. Kempf. 1994. Changes occur in the central nervous system of the Nudibranch Berghia verrucicornis (Mollusca, Opisthobranchia) during metamorphosis. Biol. Bull. 186: 202-212. Humann, P. 1992. Reef Creature Identification. New World Pub., Jacksonville. p. 344. Hunter, T. 1984. The energetics of asexual reproduction in the symbiotic sea anemone Aiptasia pulchella (Carlgren 1943). J. Exp. Mar. Biol. Ecol. 83: 127-147. Kempf, S.C. 1991. A 'primitive' symbiosis between the aeolid Nudibranch Berghia verrucicornis (A. Costa, 1867) and a zooxanthella. J. Moll. Stud. 57: 75-85. Muller-Parker, G. 1984. Dispersal of zooxanthellae on coral reefs by predators on cnidarians. Biol Bull 167:159-67. Trench, R. K. 1993. Microalgal-invertebrate Symbioses - A Review. Endocytobiosis Cell. Res. 9: 135-175.